In June 1929, Dr. Hilarion T. Feliciano and his wife, Doña Maria Mercado Feliciano, founded the Kolambugan Academy in Kolambugan, Lanao Del Norte as the first private high school in this part of the country. Two years later, the school site was transferred to Misamis (now Ozamiz City) so that the school could serve a bigger segment of the population. The school was renamed Misamis Institute. The Second World War halted the operations of the school. It reopened in 1946 and in the same year, government recognition was obtained for the complete offerings of Elementary and Secondary courses. The founders launched an expansion program: Education, Commerce, Liberal Arts, and Law were offered and gained full government recognition in 1953. In 1955, the school with its strong academic programs was renamed Misamis Colleges. In 1967, guided by his mission to provide quality education to the peoples in Misamis Occidental, Dr Hilarion T. Feliciano acquired Mindanao Academy in Oroquieta City and administered the school as an extension of Misamis Colleges. [In 1982, the school was renamed Misamis University, Oroquieta Unit]. Misamis Colleges expanded its program offerings. In June 1974, the BS Social Work was offered and the first graduate course leading to Master of Arts in Education and BS Civil Engineering gained recognition. In 1975, the BS Nursing & Midwifery was opened. The year 1977 was very significant as the institution was granted the university status. Dr. Jaime M. Feliciano was installed the First President of Misamis University. In 1979, the B.S. in Mechanical, Electrical Engineering and Nursing gained government recognition. The Bachelor in Agricultural Technology was granted government permit. Recognition was obtained for B.S. in Criminology and Secretarial Administration in 1980 and 1981, respectively. On March 30, 1984, Dr. Nestor M. Feliciano took the helm of the University and was installed the Second President of the University. His vision took the university to newer heights. During his term, more programs were opened. The graduate degrees of Doctor in Education, Master in Public Administration and the undergraduate course in B.S. Community Development received recognition in 1984. The Master in Business Administration program was recognized in 1985 and a year thereafter, BS Agricultural Education, Psychology, Biology, Zoology, Forestry, Doctor in Dental Medicine and Associate in Criminology were granted government permits. The Computer Technology course was recognized in 1988 and the BS in Accountancy in 1992. To meet the changing demands, the University offered the following courses in School Year 1993-1994: Master of Arts in Nursing, Certificate in Marine Transportation, Certificate in Marine Engineering, BS in Marine Transportation, BS in Marine Engineering, BS in Computer Engineering, BS in Occupational Therapy and BS Computer Science. In that same year, two new majors were added: the English Language Teaching and Mathematics Education for the College of Arts and Sciences and Education. In 1995 the Master in Nursing was offered and in that same year, the Forest Ranger Certificate, BS in Physical Therapy and BS in Medical Technology were granted Government Recognition. To complement the paramedical courses offered by the institution, the university built a modern state-of-the- art tertiary hospital, the Misamis University Medical Center (MUMC) in 1995. The Medical Center provides an excellent training for the students in Nursing, Midwifery, Medical Technology, Physical Therapy and Occupational Therapy while also providing quality health services in the community. In 1996, the University took a bold leap by connecting to the Information Superhighway. The INTERNET was installed through the facilities of FAPENET, the first in Northwestern Mindanao. In 1998, the President pushed to establish the Quality Standard System (QSS) of DET NORSKE VERITAS for maritime education using the standard of ISO 9001:1994 to raise the standard of training and competence of the students to a level acceptable in the global maritime industry. A year later, the College of Maritime Education was certified by DNV as having complied with the International Standard for Maritime Education. The institution continuously responded to the challenges of quality education in various fields of specialization. A one-year Seafarer Course with specialization in Deck Rating was opened in June 1999. To widen the program for computer technology, the BS in Information Technology was opened in June 2001. A year thereafter, the CISCO Networking Academy Program (CNAP) opened and a six-month Care Giver course was offered. In October 27, 2003, by virtue of Resolution No. 393-2003, Misamis University was granted DEREGULATED STATUS per CHED MEMO 21, S. 2004. The technical vocational curricula were restructured in compliance with the requirements of the Unified TVET program Registration and Accreditation System (UTPRAS) of TESDA. In 2004, the two-year courses such in Automotive Service Technician, Building Wiring Technician, Electronics Technician (machinist), Refrigeration and Air-conditioning and the one-year Nursing Assistant course were given UTPRAS registration certificates. Aggressive infrastructure projects have defined the years 2000 to 2005. It saw the rise of the H.T. Feliciano building which houses the Colleges of Computer Studies and Criminology; the Natural Science building, which houses the chemistry, biology, zoology, anatomy, microbiology laboratories; the Complex Building which houses the function hall, chapel, canteen and faculty lounge. 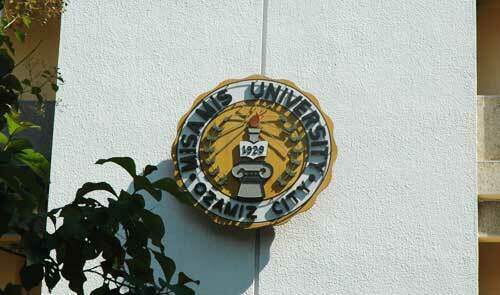 In April 28, 2005, Misamis University was certified by DET NORSKE VERITAS (DNV), (Management System Certificate No. 2373-2005-AQ-SIN-RVA) The Netherlands, through its DNV Regional Office in Singapore as having conformed to the Quality Management System set forth in ISO: 9001:2000 standard in full scope. In 2006, Dr. Karen Belina F. de Leon became the Third President of Misamis University. With the new president at the helm of the university, more developments were being undertaken in infrastructure, in academic pursuits and in maintaining the quality management system. In June 2007, the University inaugurated a three-storey building that houses the library in the second and third floors. The ground floor houses the various offices of the Department of Student Affairs, Guidance and Testing Center, Office of the Scholarship Coordinator and students’ lounge. Simultaneously, the Maritime Mock Ship, which houses the state-of the art, simulation laboratories and a mid-size Olympic swimming pool were also completed. In the same year, the university offered Hotel and Restaurant Management and vocational courses such as Care Giving (NC Level II), Health Care Services for Nursing, Animation NC III, PC Operation NC II Programming NC IV and Computer Hardware Servicing NC II for BSIT and BSCS curricula; Security Services NC II and Security Services NC I for Criminology; and Deck Seafaring NC II for the Maritime Education. In June 2008, the MU Covered Court, with a seating capacity of 3,000 students was constructed. Simultaneously, the university’s Information Systems were upgraded to enhance the MU community’s research capability and cater to the fast changing demand for better electronic data collection and management. Since then, it has continuously developed information systems that are cost-effective reliable and specifically designed to suit the needs of the university such as: Enrolment, Subject Assessment, Employee Profiling, Payroll, Inventory, Priority Numbering, E-Guidance, E-Grade and E-Grade Monitoring, Requirement Checklist Monitoring, Library Log, Tabulation and websites development. The English Department in partnership with the USAID has established the Job Enabling English Proficiency [JEEP] Program to further enhance the MU Community’s speaking, listening and decision making skills. The J.E.E.P Start and Accelerate facilities are considered “benchmark laboratories” in the institution. In May 2009, the President set forth her vision that the university must be compliant with the latest QMS Standards of ISO. A year later, in July 14, 2010, the university was certified to ISO 9001:2008 Standard. In the same month, the MU Manor, a teaching hotel was opened for the BSHRM students and to the public. Barely two months after, the Misamis University Medical Center [MUMC], was awarded by PhilHealth as the Center of Quality in Health Care Services. Within the year, more expansions were undertaken. The Computer Engineering Laboratory was upgraded with 30 unit fully air-conditioned computer laboratory. A brand-new Universal Testing Machine (UTM) was acquired for the Civil Engineering Program. A covered walk leading to the Engineering Laboratory was provided. The Maritime College has installed the latest version of its GMDSS equipment and a synchronouscope for the Marine Engineering Laboratory. In June 2011, a three (3) storey building was completed to accommodate the technology laboratory advancement in the College of Computer Studies as well as provision of new offices and additional classrooms to the Colleges of Criminology, Education and the Graduate School. Simultaneously, the Natural Sciences, Crime, Medical Technology, Dentistry, Arts and Sciences, Computer Studies and Engineering laboratories were upgraded. The College of Maritime Education has also upgraded its laboratories in accordance with STCW 2010 as amended. The Full Mission Engine Room Simulator (FMERS) is a cutting edge, turnkey solution suitable for training cadets and Marine Engineers at Watch keeping, Operational and Management levels. A computerized new Main Entrance Gate was fully operational in February 2011. Alongside with these developments, the University also upgraded its research and community extension services, in cooperation with local government units, the provincial government of Misamis Occidental, NGOs and some foreign countries as partners of development, especially in the environmental and ecological management concerns. Over the past five years Misamis University has undergone its most extensive academic transformation in our academic pursuit towards excellence. We have undergone 5–day rigorous Institutional Sustainability Assessment or ISA by CHED, Awarded as Centers of Development for Teacher Education, Criminology and Information Technology programs, these, on top of our already 20 accredited programs. As a result, CHED granted the university a DEREGULATED STATUS from April 1, 2016 valid until May 30, 2019. We are also a recipient of awards by the Philippine Association of Colleges and Universities [PACUCOA] as "having the most number of accredited programs for two  consecutive years-[SY 2014-15 to SY 2015-2016]; recertified by DNV having conformed to ISO 9001:2008 with an EXCELLENT rating. Many infrastructures were added to the MU landscape such as the 300 capacity auditorium located at the 4th floor of the Library Building, the covered walks and the multi-million 4 storey Basic Education Building, the air-conditioning of our Junior High School classrooms, the construction of 2 storey building in Oroquieta campus and the continuous upgrading of laboratories and classrooms in all programs. Under her leadership, more programs were added: Doctor in Management, Master in Business Administration - Major in Hospital & Healthcare Administration BS in Hotel & Restaurant Management, BS in Accounting Technology, Bachelor of Elementary Education Major in Early Childhood Education, Senior High School Program and BS in Midwifery. It was also during this time that the university has undergone the transformation in its pursuit towards academic excellence, identity, and relevance. Misamis University was a recipient of awards by the Philippine Association of Colleges and Universities [PACUCOA] as the "First Bachelor of Secondary Education Program In Region X to have been granted LEVEL III REACCREDITED STATUS in 2013"; "as having the most number of accredited programs for two  consecutive years-[SY 2014-15 to SY 2015-2016]; awarded as Centers of Development for Teacher Education, Criminology and Information Technology programs, valid from January 1, 2016 to December 31, 2018, these, on top of the 20 accredited programs. It has undergone 5-day rigorous Institutional Sustainability Assessment or ISA by CHED garnering the highest score of 30 points; recertified by DNV having conformed to ISO 9001:2008 with an EXCELLENT rating in 2016 and lately with the new standard- ISO 9001:2015 valid from April 28, 2017, to April 2020. As a result, CHED granted the university a DEREGULATED STATUS valid from April 1, 2016, until May 30, 2019. Barely a year after that, an AUTONOMOUS STATUS, valid from May 9, 2017, May 31, 2019.